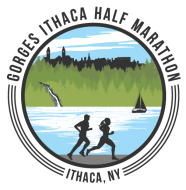 Upping the adventure value, the course uses a point to point format, running from the town of Ulysses and ending just shy of the Ithaca Commons. Runners will have a gently rolling opening road mile with the Cayuga Lake valley to one side. From there the course runs access the Black Diamond Trail where entrants will be treated to 4.5 miles of a gentle downhill grade over hard-packed cinder, passing numerous waterfalls along the way. After leaving the BDT runners will run point to point along the Cayuga Lake Waterfront Trail, before exiting for a final mile and half through Ithaca’s Fall Creek neighborhood. Each runner will receive 6 aid stations on course, a catered spread of local food and beverage post-race with a band to relax to, and a finisher’s waterbottle, medal, and cozy SS Tee that you’ll hopefully want to wear every day. Complimentary Bus Shuttle from the Ithaca Commons to the Start Line for all runners is included in the Race Entry Fee. Hopefully we’ll luck out with another beautiful weekend in a pretty great part of the world. Join us. And bring a friend. 230 queries in 2.948 seconds.